For shooting event results please see our club Facebook page. Click on the Facebook link below – You do NOT need a Facebook account to see the results. NDRGC hosts monthly 3D Bow Shoots from March through September. We use Rinehart Targets and the settings are as realistic as you will encounter anywhere. The shoots are a great way to sharpen your archery skills. A standard target range is also provided. Members are able to use the course whenever it is set up. A donation box is located inside the clubhouse. The trap range is open Tuesday and Thursday evenings from 6 to 8 p.m. during Daylight Savings Time (March-October). The cost is $4 per round for members; and $4.50 for their guests. Come join us and break a few clays! Events are held each spring and fall (check the calendar for dates!) and the course begins on the range and continues with set ups through our woods trails. The shoot is open to the public, and guided groups are led around the course. A day for local veterans to participate in archery, fishing, trap shooting, .22 shooting, & black powder shooting. Priority will be given to disabled/wounded veterans. Limited to 25 participants. Veterans Sportsman’s Day 2018 Thank You! The club runs a 10-week indoor .22 pistol league starting in January each year. This is restricted to members and their family members. Our annual game dinner, open to the public, features venison, elk, moose, caribou, alligator, pheasant, duck, bear, and other game as available as well as bucket raffles, and a silent auction. Call for tickets starting in January. Thank you to all our 2018 sponsors & guests. Each spring, we tap trees and make our own syrup! Come to the annual Pancake Breakfast and see our demonstration on how maple syrup is made, enjoy a great breakfast thanks to our friends at Russell Farms, and meet club members and learn more about club activities at the open house. All Scouts eat free when in uniform! Download Flyer. Join us Saturday, March 30, 2019 at 9 AM – 2 PM. The NDRCG and the American Red Cross are working together to Help Save Lives. 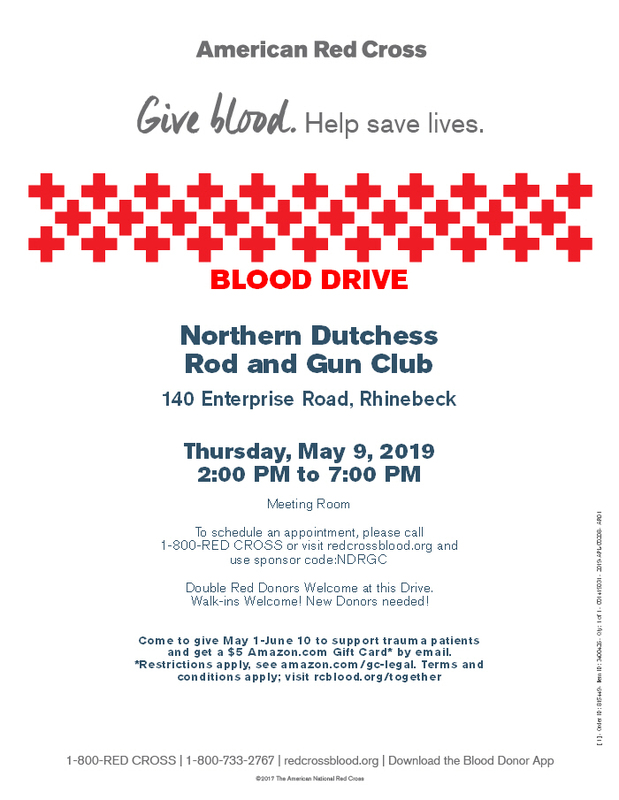 Help us fill the need for Blood during our Biannual Red Cross Blood Drive, Thursday, May 9, 2019 from 2pm – 7pm. 2019 Spring Flyer. Schedule with the Red Cross or our club’s contact, Bonnie 518-697-7608. 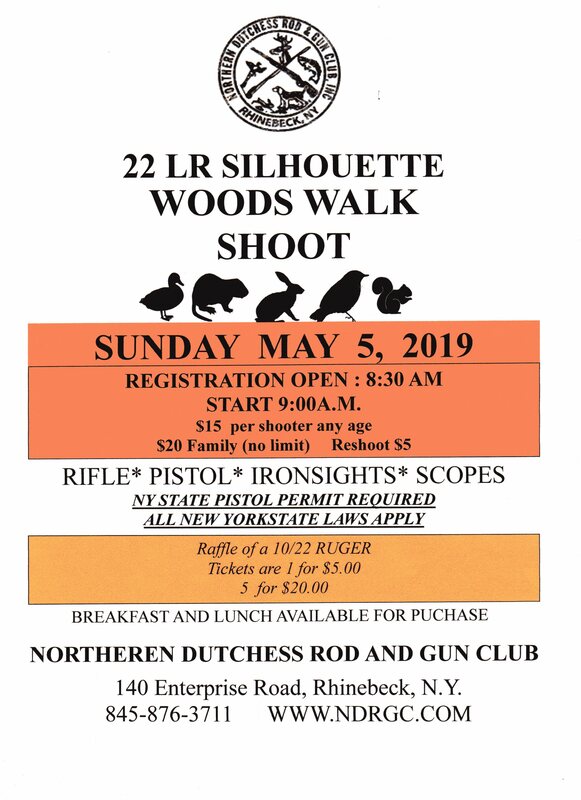 © 2015 Northern Dutchess Rod & Gun Club. All rights reserved. Website experience by Gilday Creative, Inc.